I love the change in season from Summer to Autumn; the changes in colours and light as much of the natural world moves into its dormant phase, the mystery and beauty of which we celebrate during the ancient festivals of All Hallows and Samhain. It’s a time of year that always inspires me to make art out of natural materials, collecting leaves and conkers, sticks and acorns. It’s a time of year when nature offers up its bounty without us having to pick things, snap bits off of the trees or up-root anything we shouldn’t. Of course, natural materials are the oldest of art resources – we have been using wood and stone, clay and cotton in the production of artworks for millennia. So, exploring art materials from nature is a great way to engage with this tradition and connect with the natural world of which we are a part, increasing our awareness of the impact we have on our environment and that our environment has on us. Some contemporary artists who famously work with natural materials are Richard Long who uses stones and mud, Anya Gallacio who makes her art out of fruit and flowers and Chris Ofili who caused quite a stir when he embellished his glittery paintings with balls of elephant dung! Richard Long goes on long walks as part of his creative process, collecting items of significance from his route or the surrounding area to create art on his return. Many of his sculptures and installations are composed of large stones from places he’s walked to. He even made a giant painting, directly on the wall, using muddy handprints, all arranged in a great big circle. 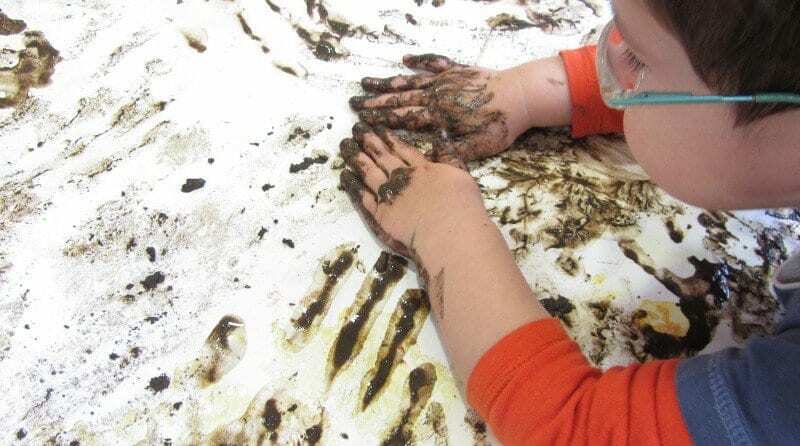 Mixing mud with a little PVA glue and water turns mud into a wonderful brown paint that you can use to make your own muddy handprint art. To experiment with different textures and effects, try adding more or less water or glue to the mud in various bowls. Anya Gallaccio relates the process of changing raw materials into artworks to natural processes of change and decay; much of her work includes letting things go mouldy! She draws our attention to the fact that when the fruit in our fruit bowls goes off, or the flowers in a vase wilt, life doesn’t cease – instead they become ecosystems for other life. A popular artwork by Gallaccio is made of red flowers placed behind a huge sheet of glass on a gallery wall. The flowers slowly rot and grow mould during the exhibition, creating constantly evolving shapes and textures. You can make your own changing artwork using autumn leaves. Choose the ones that are still soft – red, yellow and green ones are best – and arrange them on a big sheet of sticky back plastic. When you’re happy with your arrangement, place another sheet of sticky back plastic on top. Use sticky tape to seal the edges and hang your leaf picture on the wall. Place it where you can get a good close look at the way the leaves change. I use a lot of pressed leaves in my own artwork and find that collecting and pressing them throughout the year provides a rich, ongoing resource of leaves in a variety of sizes, shapes and colours – perfect for kids’ collages.